Capturing this event in words, is a very hard task to execute. However, I was up for the challenge of running 12km at my unfit stage of my life and I am up for the challenge of capturing the essence of this event now. 22016 is the year that Adidas South Africa entered the running game, which is a good thing because I have been keeping track of the international running scene. Adidas Runners is a developed concept in other countries and I was waiting for South Africa to jump into the fray. When the Johannesburg RunBase was launched, we were not invited and I made it my mission to participate in the next running event that would be launched. In all my running years I have never come across such a pretty race pack. I mean it came in a box, like where have you ever seen a race pack in a box? The Race pack contained 6 tee shirts, 6 timing chips, 6 arm bands, stickers and the race rules. 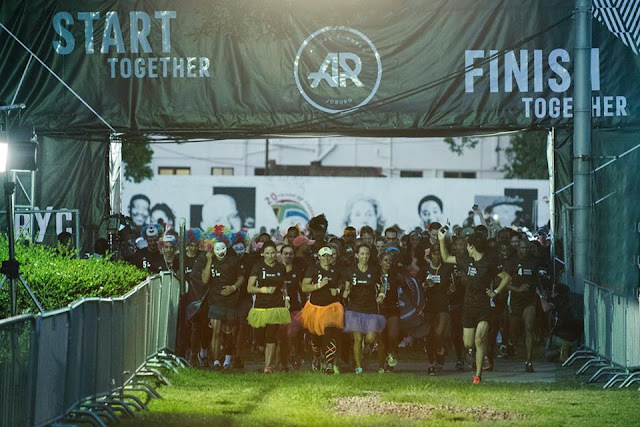 Not included in the race pack was the R50 uber voucher that each runner was provided with for a single trip. This race was marketed as an inner city crew run and so in my head, when I hear inner city. I think fox street, maboneng, end street, Hilbrow etc because I have done city runs before such as the Nike Run Jozi and the FNB Joburg 10K city run . I was really dissapointed when we took a left on Rissik street and pretty much ran away from the inner city. I understand that the city has a reputation for being unsafe however we have ran in the pits of Johannesburg at 8pm at night through Hilbrow. 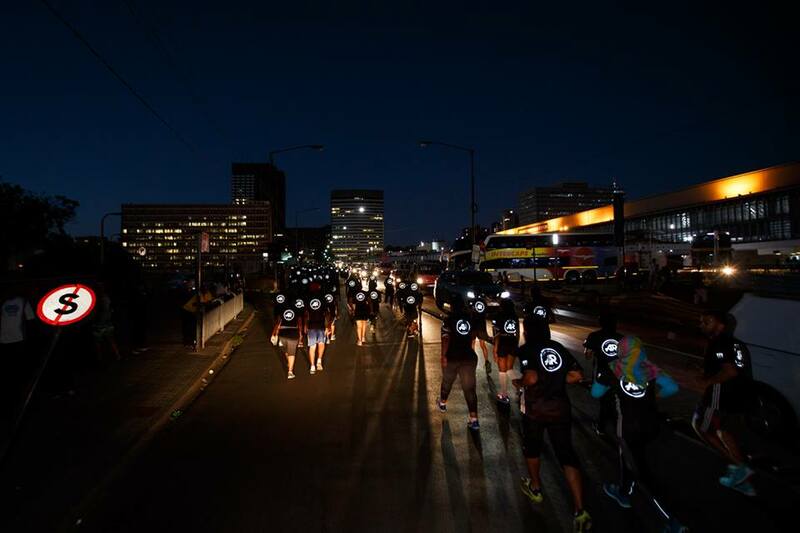 When a race advert says inner city run this is what I expect.I definately do not expect to be running in the streets of Parktown, the streets of Parktown are probably tired of NRC runners pounding them during week nights. 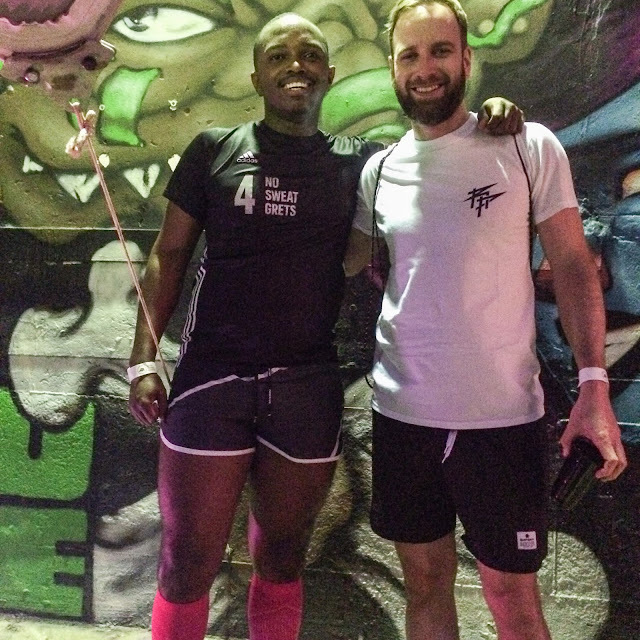 Running through Johannesburg CBD at night is an experience that lasts you a lifetime because unlike New York and Berlin. I wouldn't be able to run at 8pm through Hilbrow or Berea. So when a race takes me through those sections of the city, I appreciate because its something new that I enjoy through the safety of the group running. We have ran the tree lined surburbs enough, its time to really go into the city. Apart from running in the surburbs, it was an okay route with steep inclines here and there, especially going through Wits university. Even though roads that are not popular were closed off and used, I hated there was cars driving in between us and we constantly had to look over our backs. This is the last thing that I want to do when I am in a race. Also there wasn't water at the 3KM point & we only got coke at the finish line. There weren't any medals at the finish line. We were presented with a drinks coupon and an arm band. I know with the calibre of runner thats at a street race every saturday this would have been a major problem. I don't really wear my medals or keep track of them anyways so this was not a problem for me. My medal was meeting Sven from Run Pack Berlin, we have in communicating on facebook since way before I started this blog. Adidas dubs itself as the home of Energy running. During the run I felt the energy from the bystanders, they cheered us on and offered us beer. The race was lively around constitutional hill, this also reason why I love running through the seedy parts of the seedy. I remember when I have done night city runs in the past, residents peer out of their flats and they cheer the runners on. This feeling is electric. There were also spots along the race where there were live performances. The atmosphere along the route was boring, the atmosphere after the race was ENERGY ON FLEEK. The block party!!! guys this was the best part of the night. The atmosphere was amazing! There were 2 stages, 3 bars and a food market. All of this was positioned in an alley in Newtown under the M1 highway. I mean ?!?! what is a better way to party in the city? There were various performances by several well known artists. The highlight was when Dj Kent took over the decks. I wish you were there to experience it. It still gives me goosebumps now thinking about it, I am currently playing his album as I type this. That block party is probably the best party I have been to this entire year and it was a perfect way to close off my 2016 race season. Would I do this race again? Definately, I would like to do the other Run Your Crew events around the world. If Adidas ZA does a cape town edition I would like to be there as well. This was Adidas ZA's first step into the Street Running/Crew movement and they certainly executed it well. Thank you to my crew THE NO SWEAT GRETS, I was struggling to maintain pace but they kept me in check as from this race I am back to running again.